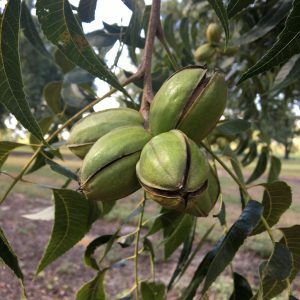 Our pecan crop is finishing up in Wilcox County. I’m seeing shucks split all across the county. We are seeing some scab on the shucks now, the rain was tough on us this year. 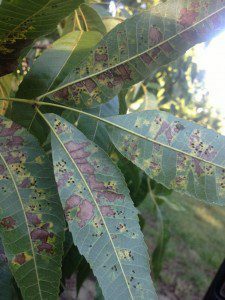 According to UGA Extension Pecan Specialist Dr. Lenny Wells, scab in some areas of GA was worse on more tolerant varieties (Stuarts) than it was on less scab tolerant varieties (Desirables). This is interesting and something that our pathologists are looking into for possibly different strain. There are also situations where shucks are declining, rotting in odd ways we don’t normally see. With may see some issues with this year’s crop. It feels like it’s been as hot or hotter in September than in August. With late heat and humidity around harvest, we are seeing some sprouting right now too. With kernel fill complete, do we still need water? There is still some demand for water now – especially with heat. We need to keep soil moisture good. Dr. Wells recommends we still need to continue to irrigate about 50% of full rate until we get ready to shake trees. As the crop nears maturity, the tree’s physiology changes. It goes from sending energy to the developing kernels to preparing to store energy in its perennial tissues (roots, stem, trunk). The first sign of this is the yellowing that occurs with leaf senescence as chlorophyll is depleted in the leaf. 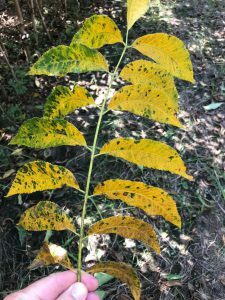 Leaf senescence is driven primarily by photoperiod as the days get shorter. Stress, most notably drought stress, but also any other form of stress (crop load, insect and disease pressure, shading, lack of sunshine, etc.) can hasten this progression. With the change in soil moisture conditions over the last few weeks, I suspect drought stress is a primary factor in what we are seeing now. Even if you are irrigating, those trees have active roots out beyond your irrigated zone that have been able to access good soil moisture for much of the growing season. Now that we are at the end of the growing season, with a heavy crop load on many trees, it has been very dry throughout much of the state for the last 3 weeks or so and those roots outside the irrigated zone no longer have access to water. This sudden change likely led to the early leaf senescence we are seeing on some trees. There is no need to try to offset this with additional nitrogen application at this point. Just continue to irrigate. Whenever we do get a good rain we will likely see another period of leaf drop but the trees should still hold most of their leaves if you are irrigating up to the time you begin shaking. Posted in Pecans. Bookmark the permalink.